I have a very vague memory of visiting the outskirts of the old Pontins holiday resort, just outside Morecambe. It's just a distant memory of visiting a pub that Jim Bowen owned at the time.He used to visit the social club I was a member of and we trecked out there one weekend to support it. I can't remember if Pontins was still open as a resort then, probably not, and I've never actually been in it but I found these pictures at Level 2 strangely moving. If you click "gallery" after the article there are a lot of pictures of the derelict site. This building, that looks like a ship, has been totally demolished. What a little gem, gone forever. So many people have been using the comments section as a message board I have decided to create a proper message board for them to use if they wish. Went here twice as a teenager for Association of Organ Enthusiast holidays in 1993 and the last ever one in 1994 before it had to move to Pontins Blackpool because the site was closing. 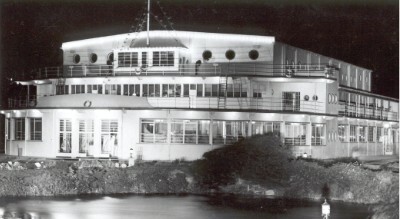 Have the best memories of the big ship venue and the restaurant seemed enormous. Bit run down by that time but still incredible. I was working for the local electricity board in 1972 and was part of a gang installing heaters into the chalets,we were there several months and I never thought I would ever forget the tune that was played at 08.15 every day...but I have. Does anyone know what it was I`d love to hear it again. ..happy days. Happy memories here at Middleton towers I worked her in the late 70s in the pontinental bar the bar manager then was dave Barlow. My friend billy kelly worked on security at the time. What a great time we had at pontins, I started working her as a barman filling shelves and such but ended up as bar cellar man in the pontinental bar. Crazy days. But very happy days. Would like to hear from anyone who worked there about 1977-78 I think it was I used to go out with the Asian girl who worked in the chippy on the camp along with others I met there, she moved to a hotel in Blackpool called the norbreck Castle. Played Pontins 1968 with band called The In-Sect. Were you the drummer of the same name who played Pontins Morecambe in1964 in the ballroom with The Jack Brent Trio including tenor sax and Clarinet, Howard Murray, for dancing before Paul Gold's big band came on? HOME Address at the time Coronation Street Hyde, Cheshire? Please contact saxjazz99@gmail.com 07940 837342 or give an email address. Been searching for you since 64.. I was at Pontins Morecambe around 1974/5 until 1977 with my family. We lived in the bungalow leading in to the camp. My dad was Derek Smith general manager. The orchestra was Harry Bence and his wife Betty Sang.....she also worked in the dress shop. John Simmons was security and I remember a guy called Mike, maybe bar manager then and his wife Jo, they had a baby daughter Zoe. I think Carol Lee Scott (Grotbags) used to perform too. I went to Heysham High. Any photo's to prompt my memory from that time would be great! Hi all it was (is) a great place to work no matter where you worked I myself worked in the bar and the beer cellar making sure the beer/spirits were all in good supply I was a barman who served the waiters hatch so I was very busy I remember Sandy/Diane from Welyn garden city London but most of all a girl called Eileen from Birkenhead she came to my house a few times and went out into Liverpool for a meal& drinks stayed over and that! !I cannot remember her surname unfortunately but if anybody knows of her or me (must not forget me!!! )You can contact me on face book it would be great to contact more memories !! My mum and dad met at Pontins in the mid 70s. Her name was Ann Harkison and he was called Bob. Dad was a musician in a band (duo) with his brother Eric. Mum worked in the chalets I think. Sandra Hubbard, I was friends with Johnny St Leger. I last saw him at the Palace theatre in Manchester, he was married to a dancer in one of the shows there, sadly he passed away some years ago. Hi all, my name is Chris and I was the projectionist at Middleton Tower in 73,74,and 75. I worked with the electrician Alan Turner and George the stage manager in the Berengaria. I would love to hear from anybody who worked there at that time. Thank you, I look forward to hearing from you. I was there on holiday in 1972 and 1973 as a child have really fond memories of the swimming pool and the playhouse. Remember the old inn by the main entrance. Supposed to have been haunted! Real shame it's all gone now. I worked in the pontinental bar which only served half's of beer. My supervisor was Doris and her son was a Bluecoat name of Johnny St Leger. Had some fabulous holidays there later on 1979/1982. I worked in the pontinental bar in 1974. One of the bluecoats was johnny st.leger. I worked with his mam Doris.It was a great place to work. Sort to see it all gone.Sandra (nee Batey) Huddart. I have recently been back to morecambe on business,i went to look around the old camp at middleton towers the old bar is still there but it was strange looking at the new blocks of flats.Still parts of the old camp with rubble behind fences.I went in to morecambe for a drink the joiners arms is still there but the masons arms and the ship have changed names.We had some good times in those pubs,what a trip down memory lane. george loggie waiter/barman worked at middleton towers in 1967. My mum (SYLVIA) worked at Middleton towers as a Bluecoat from 19969-1972.. was her best years of her life! Just wondering if anyone else worked there at the same time??? This site brings back happy memories! I was a boy when I first started going in the very early 70s, in fact most of the way through the 70s. I think I remember you Yvonne, I may even have a photo of you with my dad. I remember the song alice ann, but dont have a copy. Who was the italian looking guy who was a Blue coat that all the ladies swooned after? I have a photo that is signed by most of the Blue coats, gonna dig it out and post it. i worked there in 1973 i was a barman in the then ballroom.i can remember john simons,i used to drink in the farmhouse.had some great times. Hi my dad los belcher used to run the pub also just near the entrance to pontins and its still there. It was called greendales at the time. It was around 1989 to 1992. Great memories of going to potions as a kid. Bookings manager and when I returned finance manager. If you remember me give me an email on theshareguru@hotmail.co.uk. Ii am now in my 40th year with pontins. hi, I'm looking for a copy of The Nobodies, Alice Ann, anybody have one? Hi was anyone working at pontins heysham in 1973?iwas a chalet maid with my friend maggie we were from Sheffield my name is kathy we had great times the nobodies were the resident band in the ballroom there was the farmhouse pub and the the ship one the ss something every Friday night after being paid loads of us wud get the bus into morecambe for a much needed pub crawl I remember Simons being heed of security and we met loads of great people from liverpool and I ended up marrying one and have just celebrated 38 years together wud love to hear from anyone that was there then . When my father was alive he recalled the good times as he helped to build the ballroom & bar. (carpenter by trade) After this contract ended he was taken on primarily as a carpenter / odd job man. I am sorry his not arround to tell us more about which year & the things he encountered. john simons was security manager not camp manager. can remember yvonne and her husband taking snaps.great days and great friends so sad to see the pictures before demolition. RAYMOND.. Hello. I am Yvonne Trachy. I was the photographer at M/T along with my late husband Alan. for many years. I remember you in the darkrooms.Hope life has treated you well! I've had to implement a sign in or type the on screen code before you can post a comment, to try and slow down the spammers - hundreds a day. Hope you continue to enjoy using this comment thread to chat about Pontins. Sorry forgot to mention in the above post. If you are the Mad Max I remember, you and Bradley Walsh were in the chalet under us in '81 and I got you with a bucket of water while you were outside practising your saxaphone. You were a bit upset at the time. It might be 31 years late but "I'm sorry Mate". I don't know if people are still using this message board. Just in case they are does anyone know if the Ian Gillies (posting above) comes from Glasgow? If he does I remember him well along with the rest of the Glasgow kitchen crew. I remember thinking that I was mates with all of them but because of accents / alcohol etc I could hardly understand a word and was never certain whether we all got on or not (kidding). There were hundreds of staff there from Glasgow and Liverpool in '81 and '82 and only four of us from Sheffield. Me and my mate Steve Elwis (Dining Hall Supervisor) and two other blokes John (forgot his surname - famously took his girlfriends Mini for a drive on the beach and lost it in the quicksand) and his mate who was profoundly deaf. As well as names mentioned above,I knew well John Taylor (waiter), John Murphy, Ged McAll and Paul Green (Dining Hall Porters). Steve Crisp (bar cellerman that I still know), Tracey Oxley (who I still know slightly. We've been married for 28 years). There are lots of other people I remember well but I can only remember their first names. Fantasctic times and I met some fantastic people (wife excluded - ha ha). Oh btw I was a waiter in '81 and '82 at Middleton Tower and worked at Seacroft, Gt Yarmouth as a waiter in'83 for a shortwhile. I knew Phil Jones very well (and so did my wife), although no one on the camp knew him as 'Phil' at the time. He had a nickname that everyone knew him by. I suspect other people posting on here would have known him well but would not have known that his real name was Phil Jones. If no one else has got back to you yet about your Dad Email me at david.goddard@talktalk.net because I'd be happy to tell you what I know. I was a waiter in at Middleton Tower in '81 and '82 (my wife as well in '82) and then we worked with your Dad the season after that in East Anglia. I worked at Middleton Tower in the summer season of 1960, my very first professional music job. I played the piano in the Tudor Bar, and shared the stage daily with Alan Clift (who sang songs and told jokes). Les Nightingale was entertainments manager and the camp comedian was Sandy Lane. Great summer, with many eye-opening experiences. Two years later I worked a summer season at the Pontin's holiday camp in Lowestoft, and had another wonderful summer. But then I came to my senses and went back to university to get a PhD in physics. Now I am a retired university professor with man happy memories . . . Sorry try the address next to "posted by"
there who i was married to for 30 years.if you look on the nobodies manchester pop group from the 60"s you will find some history about them. i saw them in a club nr doncaster years later.they were a really versatile group.they also appeared on new faces in the 70"s hope this helps. Remember Pontins well. I worked in the darkroom (69/70) season proccessing films during the night ready for the shop next day. Does any one remember who run the bike hire shop in the 80's I think one was called mick from overton just down the road. I also remember the staff from the arcade Martin, brett and paul. Does anyone know what became of the fab pop group called the Nobodies that performed in the sundowner bar, morecombe ? Hi ,I worked at Middleton towers camp in 1968 it was a lovely camp and great people to work for .I have great memories of working there . Visited Middleton 1952, 1954 - 63 with my parents in the old Whit week which included my birthday. At breakfast I had to stand on my chair in the dining room while the entire 'congregation' sang 'Happy Birthday'. Given the SS Berengaria was designed and built by the same architect who was responsible for the listed buildings at Dudley Zoo, how come it was not preserved along with the farm house? Great memories but maybe the Pontin's takeover was not beneficial. The tone of the camp certainly changed with staff far more 'in your face' than in the days of Harry Kamiya. I still have a souvenir embroidered hankie of my mother's showing the Berengaria, but my collection of badges disappeared in the 70s. I holidayed there with my family for a week in 1967, I was 9yrs old and I have very fond memories of it.I can still remember the name and nos of our chalet, it was 50 Ullswater,and being wakened at 8am each morning with the song-Somewere My Love blaring from the speakers.I remember the dining room with the walk up the huge staircase and the names of the team you sat in Embassy and Regal I think?The Bluecoats used to line up at the top of the stairs and they'd be clapping and singing to Hello Dolly.I loved that holiday, and out of all the holidays ive had in my life, if I could choose one to re-live it would be that one. Russell.. Hi! Our daughter (Caren) now has two lovely teenage daughters of her own (17 and 19) How time flies. I have a new partner now. You may remember him He`s Dave Owen who was maintenance manager at Middleton We have just been up to the old site with some friends for coffee. There is a retirement village there now. Farmhouse, Tudor Bar and Tower are still there (Listed) Farmhouse and Tudor now connected with a new build restaurant.. The Tudor is now a state of the art Gymn. As you may have guessed I still...or should I say we still live close to the old site in Overton..
Hi Dodge: I remember you and your "Gang" from Whaley Bridge/Buxton area ?? I played Drums in the Russ Lewis Showband and recall giving you all a lift into town in the back of my van ................ could be mistaken... It was about 30 yrs ago !!! HI Yvonne: I remember you and Alan (sad to hear of his passing) & Daughter (I have a photo of us with her as a Bunny Girl) being omni-present, snapping away in the Ballroom. Hello, i read your site, this a best site from me, thanks! Before I was 11 (God was it really 1964) I went to Middleton towers every year. Most times my father won the talent contest (singing) and we'd get to go back for a weekend later in the year for the talent finals. Probably he'd not bother to re-enter but once he came second to a vent act, who later won the final of Opportunity Knocks on TV. Reflected Glory. The Cameo Family owned the camp. Les Nightingale was the camp ents manager. Every single memory is shining in magic from the first sight of the Berengaria across the flat fields of wheat. the penny arcade across an alley from the ship. The punch ball just outside the Arcade that my dad had to lift me up o hit. The dance hall with a cafe at the end where a Horlicks ended my day.. The barrel shaped eating hall with "Bon Appetite" in red letters on its green wartime metal. The lights that framed walkways (usually useful because it was raining). So different from the monochrome Manchester, school and street. Middleton towers was as exotic as "Abroad" is now. Probably more so. Colour when the there was none. Fun when it mattered. Dreams when I was so young. After I was 11 Pontin's took over the camp (forgive any historical inaccuracy) and we "upgraded to Butlin's. My! I thought it was posh. In Skegness, Ayr, Minehead, Filey etc I had a wonderful time. But nothing will compare to lights, sounds, smell, and old fashioned fire engine in a little house, of Middleton towers. If Hi dee hi wasn't based on it. I'd be a monkey's uncle. But don't patronise it, This was a very special place indeed. I look on Google maps from my home now on the south coast and can still see the ghosts. Listen hard and for second sitting campers....lunch is now available. Merry Xmas to everyone. A Happy and healthy New Year. Hi Sandra... I'm back from four weeks in the sun. - lovely. Came into Gatwick to thick snow! As we travelled home to West Wales - (God's country, of course)it dissappeared. I have friends who live in Sydney and their daughter, Morag,is a friend on facebook.Also another friend (fellow golfer)lives in Brisbane but comes home for part of the summer. I loved Perth when we were there. Cycled for miles up the side of the Swan river. Sad about Mort, Too young!As you say it's the age! God get off that track. Have a great Xmas singing carols in your bikini - can you still get into it???? Hi Sandra... Anne is away soaking up the sun at the moment.. I was a Zio angel(dancer) from 1964.. married Alan the photographer(I was Yvonne Cross back then) Joined him on the photography, and we were still there when it closed in 1994. I remember Sonia well. She was a bluecoat Ran Radio Pontin with Myra. I used to work there part time with them.. I also remember Zandra and Mort (later..married). Sadly he is no longer with us.. He and Zandra parted again, and I lost touch with her...... I think remember Marlene singing! I am still in close contact with Rosemary Bennett (managers daughter) Her brother John now lives in Finland Sadly her Dad, Eric died about 4 years ago, and Mother,Mary, last Christmas..
Hi Anne Wilks, do you remember Sonya? She had very blonde hair and came from Newcastle way.I cannot remember if she was a dancer or just a blue coat-she was there 1963.I worked with Zandra who was Mort Allans girlfriend.I came to Perth Australia over 30 years ago-hard to believe so many years have gone by so quickly! !Also I had a friend called Marlene(hairdresser/singer)who was there 1964-she now lives in France.Melting over the computer today -37degree's and its not officially summer untill 1 December! !Wouldn't mind abit of English rain.Do you remember a photographer called Peter,a carefree happy soul he was. G'day from W.A. lifeguard stroke bluecoat, john worked in the nursery. If Diane Ridgeway who also worked in the nursery is out there and can feel it her heart to forgive me, i can tell you now , i have always regretted i did not marry you. Nearly sixty now, wish i had spent it with you. I was a Zio Angel 1962/63/64. If you saw any of the camp shows you would have seen us. We doubled up on Blue Coat duties as well. I must have had my hair done,(maybe by you) at some point in the season. Yes it's sad the camp has gone. Many happy memories and of course we were young, so ...nostalgia as well. Am in touch with Yvonne Trachy - she married the camp photographer and was there for - I don't know - 25 years or so. Visited Australia in 2002 - loved it. When did you move out there? Paul, Lillian - me too.Facebook. Paulll Lillian.. I can be contacted via Facebook! Hi Paul...... Do hope Lillian will get in touch..
Hi Paul Parker, I was a Zio Angel and worked with Lillian. My last year was 1964 at Middleton Tower. I actually met you when I worked in Hull with Lill, we were in the Jackson girls then. We worked together quite a lot. - Huddersfield, Rhyl, Leeds etc. I am Anne Wilks(nee. Booth) I have quite a few photos, as you can imagine. Be lovely to hear from Lillian. hi to anyone who worked at middleton towers in 1963.I am sandra,I worked in the hairdressing salon.The sixties were just taking off-the stones-the beatles-all the now world famous groups.I remember going to see eric burdon sing -the house of the rising sun.What agreat time it was to be 18 years old! !A very special person who I have lost touch with was bill fitzpatrick-where are you bill!I now live in australia,so its all along way for my memories to travel-distance and timewise too.Would like to hear from anyone around that year.Its was really sad to see the photos of the place falling to bits,a great summer,great company,one of the best times in my life. Hi. We worked Middleton Towers for many years in Cabaret as "Presto Puppets" from the late 1970s. Out of all the Pontins camps, it really was the friendliest and most professionally run. Each year we would visit the camp at least 25 times and the staff, headed by Robert Towell, was enthusiastic right through the season. Great to know that so many visitors have so many happy memories, as do we. Robert Towell and John Sharples have gone on to great things working with their own Companies in Spain. i worked at pontins in 1977- 78. it was the best 6 months of my life, i worked in the pontinental bar, god what great memories phil eccles in the canteen bill kelly on security, and heaps of girls from all over the country. it really was heaven on earth. would like to know anyone who worked there at this time. Does anyone remember Mr Dixon the Manager and he had a taxi company in Morecambe, and Ken was the Asst Manager and Julie worked in the office and another lady was in the office from Overton? I worked at pontins in 1989 as a nursery nurse and have brilliant memories of the place and all the people i met there.I did have the time of my life i was only 19 and it was the first time i'd lived on my own.